The California-based artist merges music and performance with the centuries-old tradition. With its roots stretching back to twenty-eighth century B.C China, Japanese Calligraphy – or shodō – stylistically unites writing and text through the artistic renderings of kanji and hiragana characters and syllabaries. A unique aspect of Japanese cultural heritage, the practice remains a thriving art form that is steeped in tradition. In fact, the basics of the art are still taught in elementary schools across Japan today. Master Calligrapher, a distinction that she earned at the age of fourteen years old, Aoi Yamaguchi takes a decidedly more contemporary approach to the medium. Through collaborations with dancers, music producers, videographers and designers, as well as the use of unique surfaces like canvas, mural walls, and even models’ faces and dancers’ bodies, she’s expanding the art form’s possibilities for expression. While she’s now based out of Berkley, California, Yamaguchi was born and raised in Hokkaido, Japan. Her mother, who holds the Shihan level of mastery in calligraphy which certifies her to teach, was committed to exposing her children to the practice rather than allow them to spend their time playing video games. Thus she sent a then six-year-old Yamaguchi to study under the tutelage of renowned Master Zuiho Sato. Creating, deconstructing and transforming existing linguistic conventions through the calligrapher’s brush, Japanese Calligraphy relies upon the artist's intuition to interpret these customs. During the sixth and seventh century, it was a requirement for leaders, nobles, and warriors of Japan to know how to write with a brush and has since become a significant part of the Japanese lifestyle. 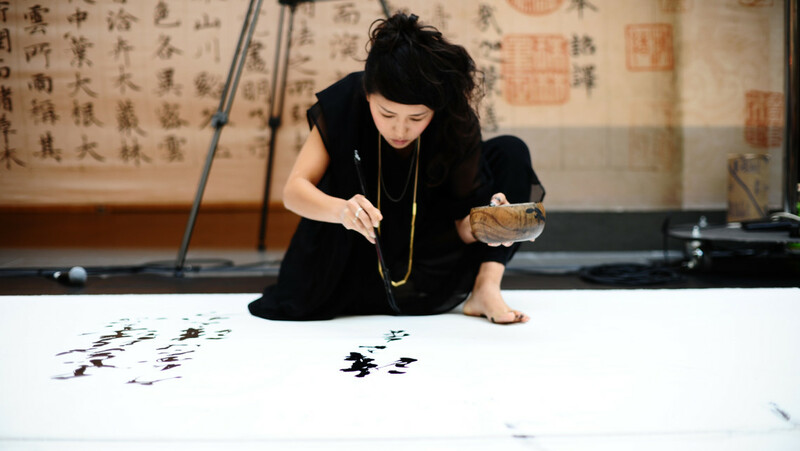 Passionate about music, Yamaguchi chooses to incorporate this into her work and combines musical elements with calligraphy’s more philosophical elements into live calligraphy performances. Though she’s traditionally trained, as an artist, Yamaguchi pushes the boundaries of traditional Eastern artistic expression by injecting into it the performative aspect. 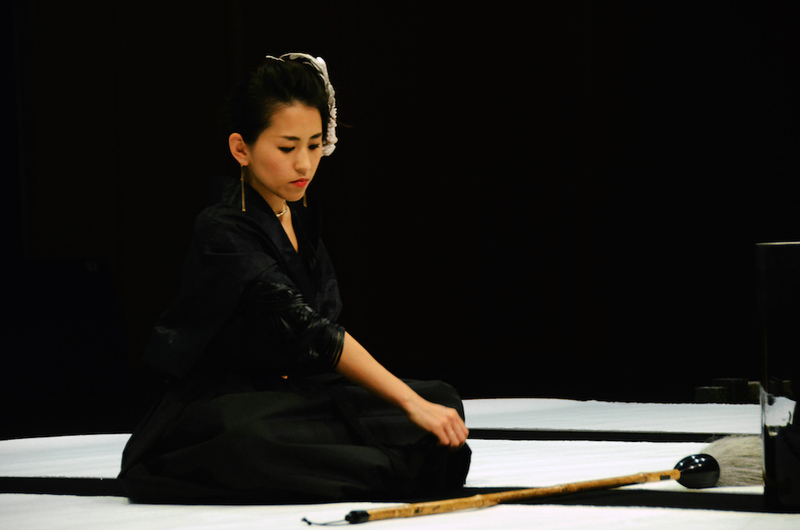 In a recent collaboration with Berlin-based musician Schneider TM, e-textile artist Mika Satomi and performance artist Özgür Erkök Moroder, she performed a conceptual and interactive large-scale live calligraphy piece in which her each move was captured by sensors and translated into a signal that controlled part of her collection of instruments. Part of Apartment Project Berlin – an annual nonprofit platform based on the collaboration of interdisciplinary artists and researchers by living and working together – the project was lent a degree of tangibility through the music and performance, drawing in the audience to become a part of the presentation. 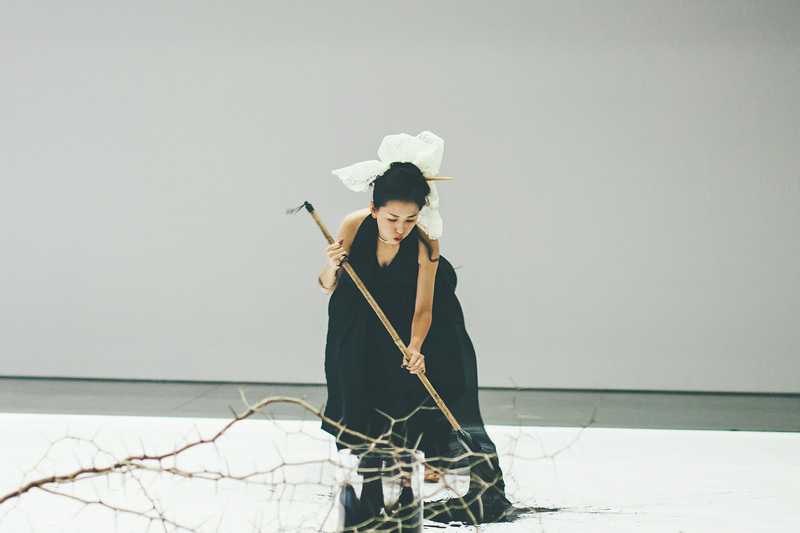 For her appearance at TYPO Berlin 2017, Yamaguchi recreated the performance, further exploring the connection between the mind and the body. 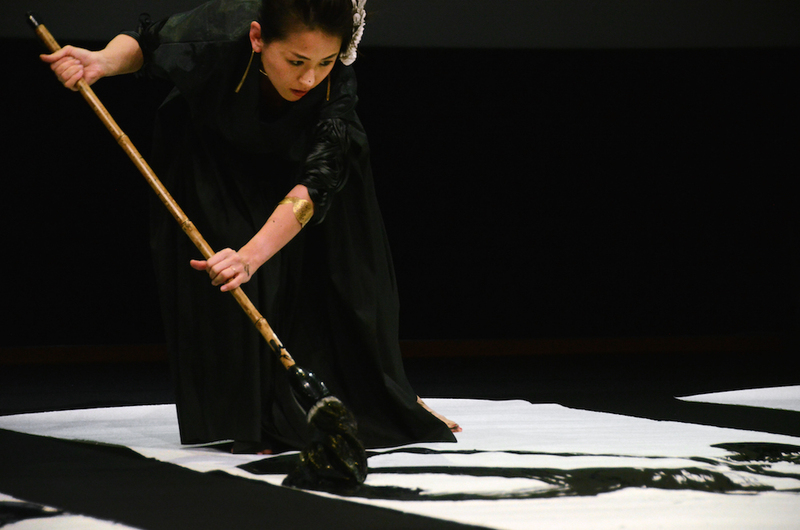 Though her performance calligraphy is certainly a diversion from tradition, it’s not as unorthodox an exercise as many would assume. In fact, performance calligraphy is gaining popularity amongst young Japanese, especially high-school students. Though their particular technique combines calligraphy with J-pop music and dance, its prevalence confirms a growing shift in the minds of the Japanese when it comes to art forms that shirk tradition in favour of more contemporary influences. To learn more about Yamaguchi’s work visit her website here.